Studies have shown that the M-Vac is better at collecting DNA than swabbing, cutting, or taping. 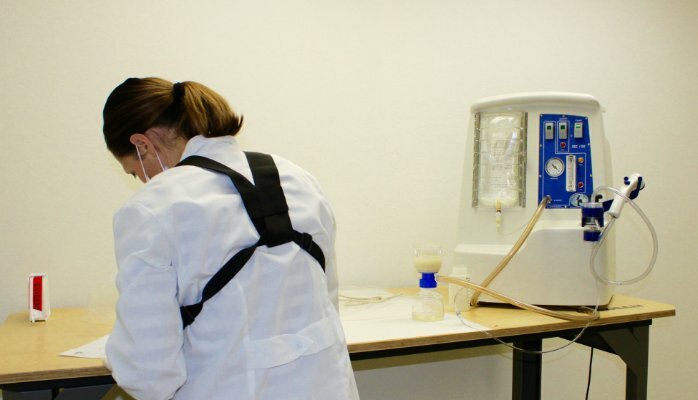 Internal validation studies by the Washington State Patrol, for example, showed that in comparison to swabbing, the M-Vac was able to collect anywhere from 36% to 189% more DNA from experimental evidence items such as extremely dilute blood (1:5000 – 1:25,000) on shirts, rocks, and wood and from touch DNA on knit caps and duct tape. The M-Vac has been shown to be successful in collecting trace amounts of male DNA on items owned or worn by females. Used in combination with Y-STR testing, large areas of female’s clothing can be sampled into a single filter and anywhere that the male suspect came into contact with the clothing could potentially yield male DNA. A forthcoming study from UC Davis is expected to illustrate the ability of the M-Vac to collect male touch DNA from clothing items worm by victims of simulated assaults. In actual casework, the M-Vac has already been successfully used to collect trace “touch” DNA from the underwear of a female child homicide victim who had been partially submerged in water for up to 10 hours. The M-Vac can even be used on human skin when a specialized, vented, sampling head is utilized. One study, by UC Davis researchers, found that after saliva was applied to skin and dried, male DNA could be located on female DNA skin even after showering. This finding opens up a whole new avenue of DNA collection possibilities in sexual assault cases. This would be especially true in cases where the alleged victim may have been incapacitated at the time and does not have a clear recollection of where the perpetrator may have touched, licked, or kissed them and swabbing large areas is unrealistic. The M-Vac can be used to collect from the alleged victim’s entire arm, leg, torso, or other area in an effort to collect foreign DNA. The discussion above may lead some to wonder if the M-Vac has been successfully used on actual casework samples, and if so, have any of these cases been through the court system? The answer to both questions is a resounding, “yes!”. Success stories can be found on M-Vac’s website (www.m-vac.com) and involve homicides, sexual assaults,and cold cases. The murder of Uta von Schwedler, a University of Utah researcher, was solved in part due to the DNA results that were able to be obtained from a pillowcase though to be associated with the crime. The main suspect in the case was the victim’s ex-husband, John Brickman Wall, a pediatrician. Although a partial Y-STR profile was developed from the pillow, the suspect’s son also lived in Ms. von Schwedler’s home and, considering that the Y chromosome is passed unchanged from father to son, could have left the DNA behind. M-Vac testing was able to collect more DNA from the pillow and DNA testing was able to place an autosomal DNA profile consistent with the defendant on the pillow. The presence of this profile was more difficult to explain considering that Wall had not lived in the home for some time prior to Ms. von Schwedler’s murder and this evidence, along with other physical and circumstantial evidence was used to convict Mr. Wall of the murder of his ex-wife. A concern that has been expressed in the past is that the M-Vac might collect “too much” DNA. Although I must admit I am not completely sure what “too much” DNA might be, I can understand a fear that the M-Vac might pick up extra DNA to the point that an uninterpretable mixture might be obtained. While that is certainly a possibility, just as it is with the swabbing technique, it is also now possible to interpret complex mixtures with the aid of probabilistic genotyping software. In addition, internal validations from various agencies have actually shown that in some instances the M-Vac can lead to higher-level mixtures that are interpretable versus low-level, uninterpretable, mixtures obtained with traditional methods. To see the original article on LinkedIn click here and the author, Suzanna Ryan. By mvacjb2014 in Uncategorized on April 13, 2016 .